Several examples of marine engines are displayed in the Shipyard. The largest is the 14-foot-high compound steam engine from the New York Harbor tugboat Socony 5, built in 1927. Developed about 1870, the two-cylinder compound engine had a small high-pressure cylinder into which the steam was first directed. After expanding to drive the piston, the steam was exhausted into the larger low-pressure cylinder, where it expanded further to drive the second piston. This 850-horsepower engine turned a 10-foot propeller. At sea, oil engines replaced steam engines in the first half of the 1900s. The high-compression crude-oil engine was developed by Rudolph Diesel and began to be used at sea after 1910. Safe, long-running, and powerful, the crude-oil engine today powers anything from a 30-foot yacht to a 1,000-foot containership. Two marine diesels have been restored and are occasionally run in the Shipyard. Built in Norway in the 1930s, the 83-horsepower Wichmann semi-diesel was acquired by the Museum and restored in the 1990s. The 90-horsepower Lathrop diesel was built just down the Mystic River by the Lathrop Engine Company in the late 1940s. Founded in 1897, the Lathrop company built marine gasoline engines before adding safer diesel engines to its line in the 1920s. These engines remained popular among fishermen and yachtsmen until the 1950s. When the Museum acquired it in 1985, this engine had only a few hours of service. Volunteers restored it to operation in the 1990s. The Hercules Model EK7 Engine, a simple single-cylinder (one-lung) engine with a flywheel, is typical of many thousands found all over rural America after their introduction in the 1890s. They powered small shops, farm equipment, and lumber mills in the days before rural electrification and modern lightweight engines. These early gasoline and kerosene engines revolutionized a way of life dependent on animal power, water power, or steam power. 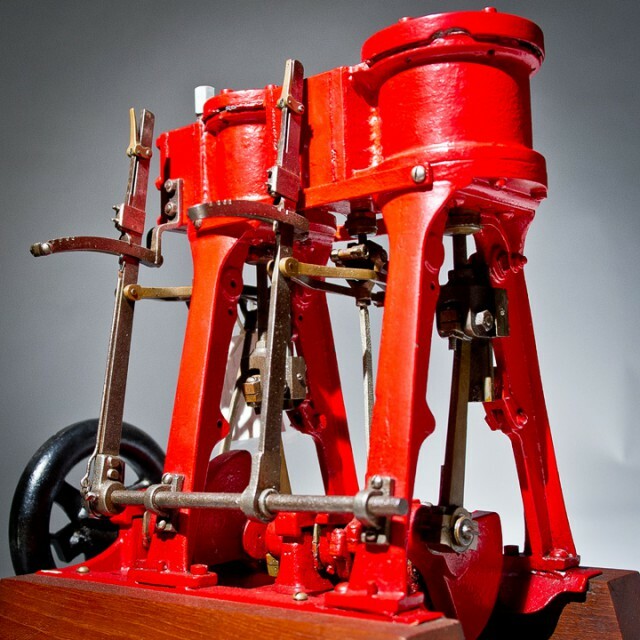 About 1900, George Washington Smith disconnected the water-powered turbine that drove his woodworking equipment and replaced it with a 6-horsepower Excelsior engine made by the Consolidated Engine Company of New York City. Like most of the hundreds of engine builders active in the early 1900s, the Consolidated Engine Company lasted for only a few years. This similar, 7-horsepower engine was built by the Hercules Company of Evansville, Indiana, which began production in 1912 and continued into the 1930s. By 1914 the company was building 150 engines a day, from 1 ½ to 10 horsepower. This engine, built in 1917, was designed to run on either gasoline or cheaper kerosene. After Mystic Seaport acquired it in 1985, it was rebuilt and is often run as a demonstration.